OROVILLE, Calif. -- Nearly 200,000 people remained under evacuation orders Monday as California authorities try to fix erosion of the emergency spillway at the nation's tallest dam that could unleash uncontrolled flood waters if it fails. 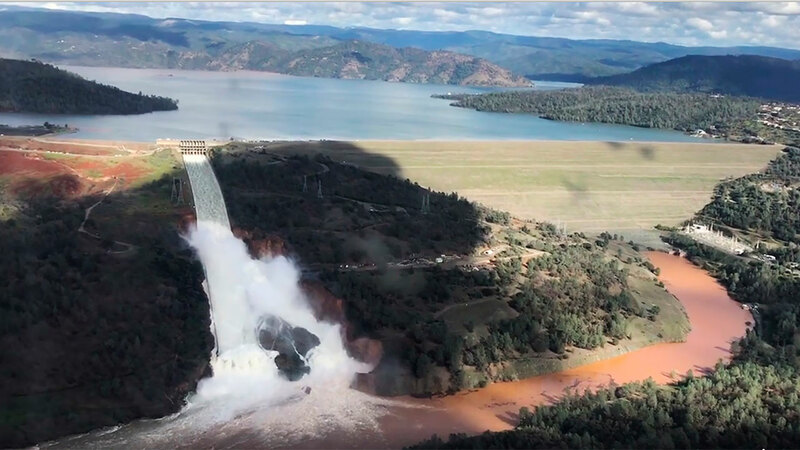 About 150 miles northeast of San Francisco, Lake Oroville - one of California's largest man-made lakes - had water levels so high that an emergency spillway was used Saturday for the first time in almost 50 years after its main spillway was damaged during recent heavy rain. "I'm just shocked," said Greg Levias, who was evacuating with his wife, Kaysi. "We have two boys and our dog," said Kaysi Levias. "All the stuff we could fit in the trunk - clothes and blankets." Raj Gill was managing a Shell station where panicky motorists got gas and snacks while they waited for gridlocked traffic to clear. His boss told him to close the station and flee himself, but he stayed open to feed a steady line of customers. "You can't even move," he said. "I'm trying to get out of here too," he said. "I'm worried about the flooding. I've seen the pictures - that's a lot of water." State Fire and Rescue Chief Kim Zagaris said at least 250 law enforcement officers from throughout the state are in the area or on their way to help the people evacuating. A California Highway patrol spokesman said they would have two planes out Monday to help with search and rescue and traffic control. Late Sunday, officials noted water was no longer spilling over the eroded area but said the evacuation orders remained in place. "There is still a lot of unknowns," said Butte County Sheriff Kory Honea. "We need to continue to lower the lake levers and we need to give the Department of Water Resources time to fully evaluate the situation so we can make the decision to whether or not it is safe to repopulate the area." About 188,000 residents of owns in Yuba, Sutter and Butte counties remained under evacuation orders. Croyle said the department will continue releasing as much as 100,000 cubic feet per second from the main spillway to try and reduce the dam's level by 50 feet ahead of upcoming storms forecast to reach the area Wednesday. Gov. Jerry Brown late Sunday issued an emergency order to fortify authorities' response to the emergency at the dam and help with evacuations. Adjunct General David S. Baldwin said at a news conference late Sunday that the helicopters will also be available for search and rescue Monday. The California National Guard put out a notification to all 23,000 soldiers and airmen to be ready to deploy if needed and will provide eight helicopters to assist with emergency spillway reconstruction, he said. Baldwin says the last time an alert like Sunday's was issued for the entire California National Guard was the 1992 riots. Officials earlier Sunday stressed the dam itself was structurally sound.